If I had known how much fun teaching 3 ladies the art of painting with beeswax would be, I'd have organized Encaustic Workshops sooner. 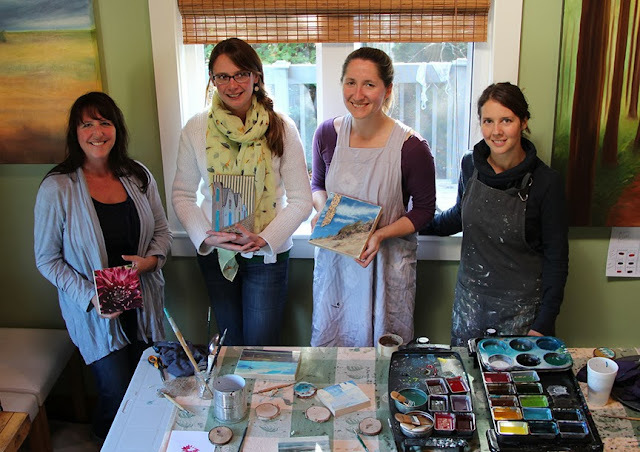 Last Sunday I was joined by Erin, Kelly, and Michelle for a full day playing and experimenting with encaustic (beeswax + pigment) painting and collage, where they learned proper techniques and tips to create a beautiful finished piece of art. Everyone worked on 3 pieces plus an ornament, but focused on 1 intricate piece. Everything was theirs to keep. With lots of conversation, smiles and laughter, good food and cappuccinos, the day ended feeling like a big success. I'm really looking forward to the next one! Contact me to sign up, or find out more here. Daina demonstrating how to mix primary oil paint colours in preparation to make your own pigmented beeswax paint. Erin layered a photo she took between textiles for a really beautiful look. The coloured doors and windows were made more vibrant with coloured wax. Erin scrapes paint from her artwork to create a rustic effect. Prepping wood cuts for painting. These make nice ornaments! 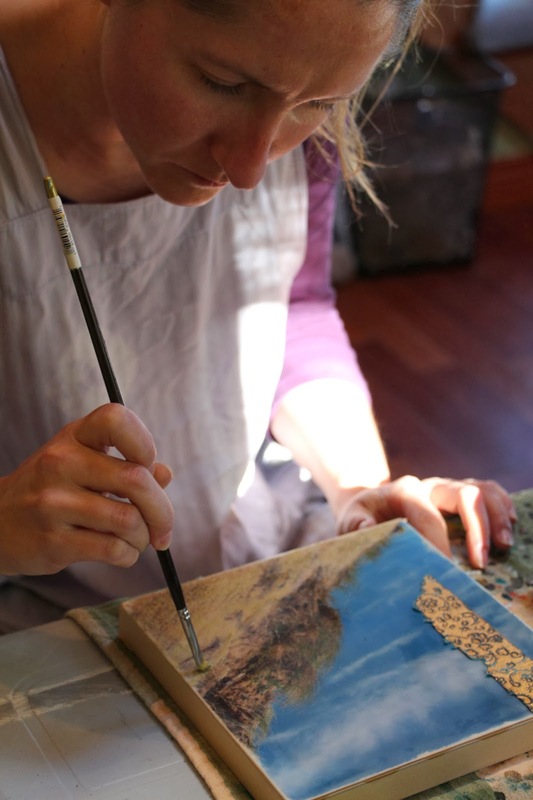 Michelle applied real sand melted into the wax for a textural effect over her beach photo. Kelly warmed the layer of smooth wax prior to carving it out for a 3D effect. From left to right: Kelly, Erin, Michelle, and Daina... at the end of the class showing their finished artwork.